Jim and Desiree Collings are seasoned entrepreneurs from two different industries. Jim’s background is in the financial services industry, where he served clients as a registered investment advisor (RIA) for many years. Desiree’s background is in property management, a business she continues to run today. After many years of building their personal wealth, running businesses and raising a family, the Collings were ready to make some changes. Jim wanted to transfer his RIA practice and focus on new endeavors. Desiree wanted to grow the property management business. Both of them wanted to make this transition in the most tax-advantaged way possible. However, a key driver in all of these decisions was how these changes impacted their estate plan. The Collings have 3 children and 4 grandchildren today. They plan to have more grandchildren in the future. 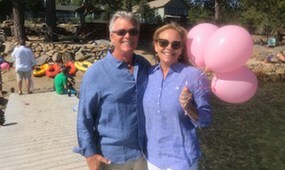 Family gatherings on the shore of Lake Tahoe are a source of great joy. While they want their children to work and practice good discipline, they also want their estate to be a blessing to their heirs and support their current and future endeavors. They want their years of hard work to provide a wall of financial protection around their family. This is why they turned to Casey Neilon for guidance. Jim Collings had hired Bill Crandall to provide services for a Nevada corporation Jim had owned in the past. Jim had been working with a few other CPA firms to provide both business and personal tax advice. When the time came to make this transition, Jim and Desiree began to do research. They looked at several other CPA firms and also at Casey Neilon. Even though the Collings were no longer Nevada residents, they decided to request an interview with Darsi Casey, Managing Shareholder of Casey Neilon. “Darsi made a terrific impression on both of us,” says Mr. Collings. “She was very well-informed on the issues where we needed guidance. She answered all of my questions and that gave me confidence. She also struck me as someone who was knowledgeable, a person of high integrity and someone with a great team behind her. That’s important to us,” states Mr. Collings. After an initial conversation, the Collings retained Casey Neilon to provide a range of services. The Collings wanted consulting services for making the business transitions they were considering. But they also preferred to consolidate their accounting providers into one organization who could be there for the long-haul, especially for helping with estate planning concerns. The Collings were also hoping to establish a relationship with an accounting firm that could provide continuity of service to their heirs. The Collings children are entrepreneurial, like their parents. “I want this firm to work with my daughters and son,” says Mr. Collings. The Collings family also has a foundation for which Casey Neilon provides guidance.